helps builders maintain the highest safety standards when preparing a site for redevelopment—providing clear and effective guidance toward containing and limiting toxic dust, and safely disposing of hazardous materials. Your health and wellness is a top priority with sites that carry our Safe + Sustainable Certification. One less thing to worry about: Sleep a little better, knowing that builders who certify with us aren’t practicing harmful demolitions in your neighborhood. They not only exceed the highest standards for Safe + Sustainable deconstruction, but are 100% committed to safeguarding your health, protecting the environment, and preserving viable building materials for reuse. Exceeding safety standards: Builders pursuing Safe + Sustainable certification share your concerns when it comes to preparing a site for redevelopment. That’s why teams who certify with us take the practice of green building one step further—by preparing a site for construction in the safest and most sustainable way possible, from the very beginning. Easily keep up on what’s happening in your neighborhood. Builders who certify with us are committed to providing clear information about their Safe + Sustainable protocols, responsible deconstruction methods, and strict environmental standards—so you can rest assured that every precaution is being taken to safeguard your health. Safeguarding your health: We work with builders and their deconstruction teams to form a plan to properly contain and reduce the risk of toxins entering the air, water, and soil in your area, and ensure the careful disposal of any hazardous materials discovered on the job. Safe + Sustainable builders are dedicated to preserving historically significant materials, as well as natural landscape features when possible. This practice not only keeps building waste out of the landfill, it also protects beloved aspects of Portland’s cultural and environmental legacy, and boosts the city’s growing salvaged-materials industry. Builders certifying with us carefully salvage, preserve, and pass forward viable and historically significant materials for reuse—turning waste into opportunity. Our region is rapidly evolving, and this growth hasn’t always felt seamless. The good news? Redevelopment can be accomplished using much more sustainable methods. 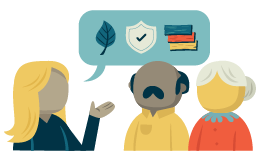 That’s why we created the Safe + Sustainable Site Certification—to ensure our builders and developers have the tools, resources, and guidance they need to responsibly make space for everyone who calls Portland home. Teams who certify with us carefully disassemble existing buildings, piece by piece, rather than mechanically demolishing them. The difference? Deconstruction retains as much of the original building’s embodied energy as possible, significantly reducing the carbon cost of redevelopment. 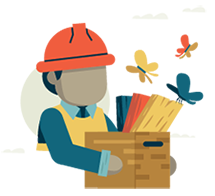 Safe + Sustainable projects benefit the broader community: For every worker employed on a typical demolition site, as many as 6 are employed when a builder chooses to deconstruct. Plus, our certification standard rewards builders who invest in Portland’s underserved communities and partner with minority and women-owned contractors. Embodied energy is the total energy required for the extraction, processing, manufacture and delivery of building materials to the building site. Energy usage contributes to greenhouse gas emissions, so embodied energy is considered an indicator of the overall environmental impact of buildings and building materials. The certification standard consists of individual measures within four performance categories. Safe + Sustainable builders receive detailed technical guidance and on-site consultation and verification. For more information about lead safety in residential construction, visit the Oregon Health Authority website. For asbestos safety information, visit Oregon DEQ’s website. For more information on building material salvage, reuse, and recycling, visit Metro’s website. 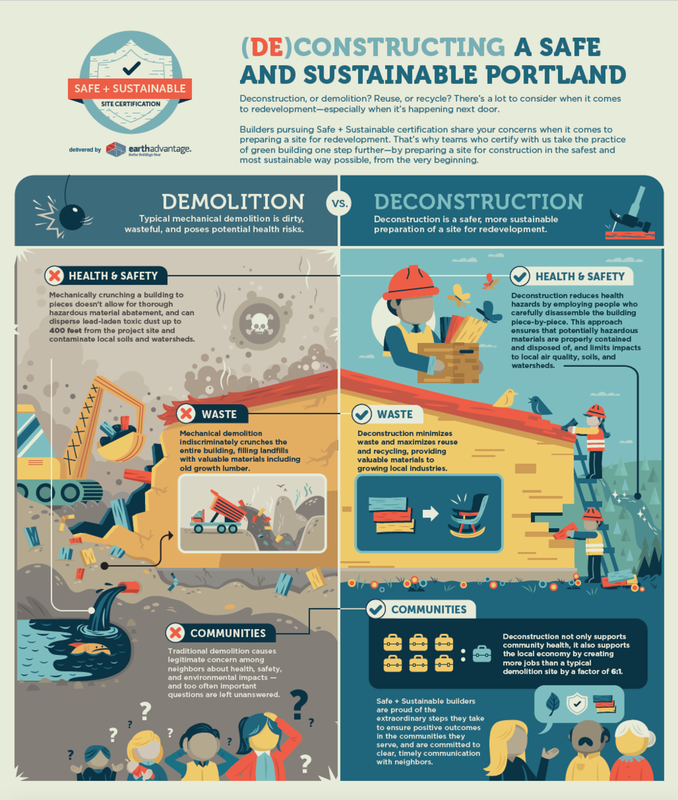 For information on residential demolitions in Portland, visit the City of Portland’s website.